This item has been discontinued by the Manufacturer. Please see our line of available 2" items here! Everyone could use a minion or two. This series features Kevin, Bob, Stuart, and all their other yellow little friends. Each figure mounts attop a suction cup stand. 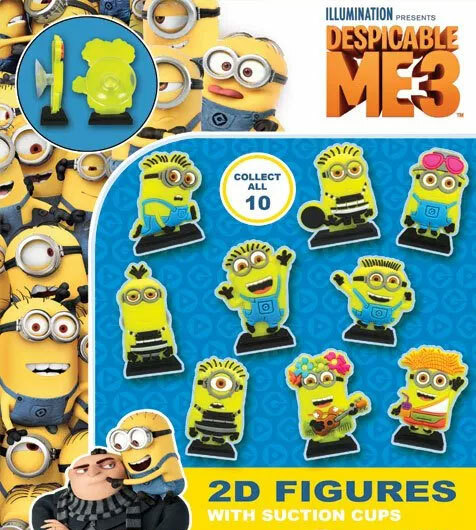 Stick them on your desk, in your locker, or anywhere you feel you could use a minion friend. Collect all 10! Capsules are acorn shaped with clear bottoms and assorted colored tops and each 2" capsule contains one toy. Every bag offers an assorted mix of 250 toy capsules which are pre-filled for your convenience making it quick and easy to load into your bulk vending machine. These toy filled capsules are ready to vend and will dispense in machines with a 2 inch capsule vending wheel.